In September, 13 schools across the NWT participated in the Great Big Crunch! The Great Big Crunch is a special day, class, assembly, lunch hour, or even 5 minutes dedicated to apples and ending in a synchronized “crunch” to celebrate. We invite schools to be creative…apple poetry, apple films, apple cooking…activities do not have to be elaborate – we would just like students to enjoy an apple (or another healthy snack of the school’s choice!). 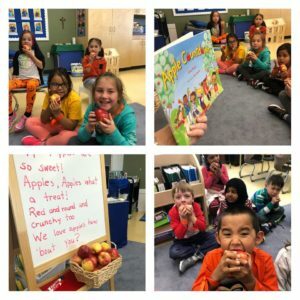 The Great Big Crunch is intended to promote healthy snacking, the importance of enjoying food together, and enhance student understanding of where their food comes from. We partnered with the NWT Literacy Council and encouraged schools to run their Great Big Crunch event during NWT Literacy Week since the event was appropriate for this year’s theme of “Everyone in the Kitchen”.